Khalida Jarrar speaks: "Focus on the message: Freedom, freedom, freedom!" Palestinian leftist and feminist parliamentarian and long-time prisoners’ advocate Khalida Jarrar was released from Israeli prison on 3 June after serving over 14 months imprisoned. 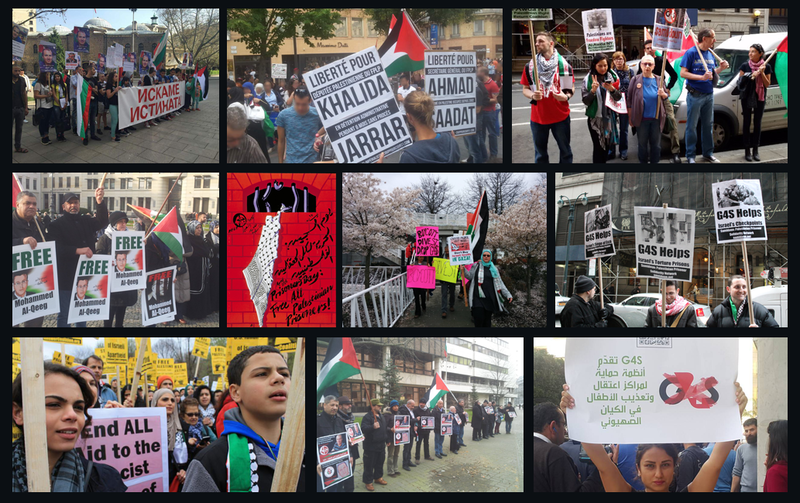 Jarrar’s release was celebrated widely by comrades and supporters, and by international activists who urged her release since her 2 April 2015 arrest. Samidoun’s international coordinator, Charlotte Kates, spoke with Jarrar to congratulate her on her release and express the greetings of the solidarity movement upon her freedom, noting that her release was welcomed as a victory around the world. Samidoun conducted a brief interview with Jarrar in which she discussed the current situation of Palestinian prisoners and priorities for the movement to support their struggle. “The second issue is family visits. Some Palestinian women prisoners are denied family visits or their family members are denied permits. Mothers are permitted to hold their children for only ten minutes. Family visits and lawyer visits are critical for Palestinian prisoners and their well-being. In particular, the ICRC must be pressured to stop the cuts to Palestinian prisoners’ family visits,” urged Jarrar. “The third issue is overcrowding, which is very much a reality from which Palestinian women prisoners suffer. There are too many women in too little space with very little access to necessary facilities,” Jarrar said. Jarrar highlighted the case of Lena Jarbouni, the longest-serving Palestinian woman prisoner, who has been imprisoned since 2002 and was excluded from the 2011 Wafa al-Ahrar prisoner exchange which saw other women prisoners released. “Lena Jarbouni is a true Palestinian hero. As you may know, she is the representative of Palestinian women prisoners in HaSharon, a true struggler. She has been imprisoned for 15 years; she was not included in the prisoner exchange. You can imagine her feelings when she was told that she has been excluded. Not only that, but she was put in solitary confinement, alone, and had to face tremendous difficulties and illness,” said Jarrar.